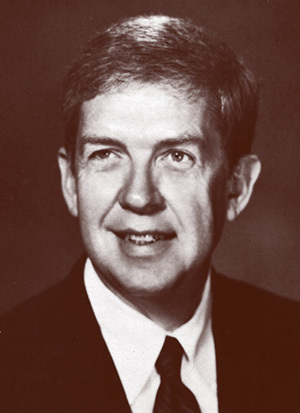 Nugent was the first person to serve as chancellor in the university’s 110-year history, allowing then President James E. Martin to concentrate on the University of Arkansas System as a whole. Throughout his career, Nugent held numerous administrative positions. These include the positions of director of the School of Music at the University of Oklahoma, dean of Sciences and Art at Washington State University, vice president for academic affairs at West Virginia University, the first chancellor of the University of Arkansas and the Stevens Distinguished Professor of Musicology at the University of Arkansas, and he was the long-time president of the University of Illinois Foundation. Nugent earned bachelor’s and master’s degrees from Southern Methodist University and a doctoral degree in musicology from North Texas State University. Widely recognized as a conductor and pianist, Nugent is featured on six recordings, and appeared as guest conductor of the Oklahoma City Symphony Orchestra. He has also published six books and several articles on music, as well as on broadcast journalism and the law. Personal: Nugent was born in Courtland, Ala., in 1934. He married the former Clara Burgess on July 8, 1983, and they have two children.